We all forget to do something such as run an errand or un-mute our phone. This is a guide about creating reminders for yourself. When I want to remember something I need to take with me to work or anywhere the next day, I take a plastic shopping bag (like from Wal-Mart) and I tie it to the handles of my purse the night before. 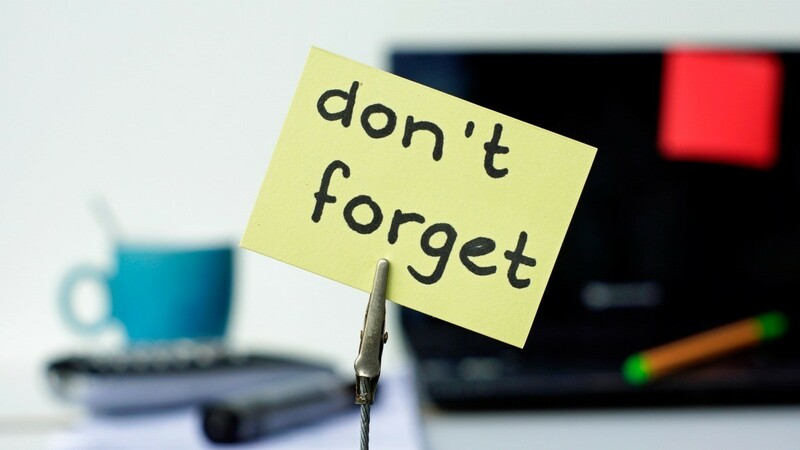 This is so easy and simple to do and better than writing in a note as a reminder and then losing the note. It works every time for me and if I needed a bag to put the item in, I have it right there ready for me. I also set whatever I have to take with me in front of the door. Then, I can't open it without taking it. Yours is great too! I do this with the item in the bag already, and if it is refrigerated then I tag a note there, too. Ever think of something when you are out, then forget it by the time you get home. I have solved that problem for me. I put my name and cell phone number in my contact list on my cell phone. When I think of something like what I need to do later,who I should call later, or something I need from the store, etc., I text myself a message. I can check the message at a later time. Sure is a big help with my senioritis. My old cell used to have a notepad option and I used to leave myself messages all the time. I guess with the changes in technology your way would be more likely do-able. I do this all the time, plus if no one's home I will call my landline and leave a voicemail reminder to myself (or several) and listen to the messages when I get home! -Find your contacts list (or address book) on your cell phone. - Create a new contact, inserting your own name and telephone number. - When you want to text yourself, find your name in your contacts (unless you put yourself on speedial :) and click to proceed to create a text message to send that person. - Write your text message (notes, reminders, appointments, grocery list, whatever!) and send! - In less than a minute or two you will receive a text message (from yourself) with your message. If I really, really need to remind myself of something important to do, I put a sticky note on the steering wheel of my car. Example: stop at store on way home from work to get milk, go to the bank, etc. I've had a lot on my mind lately and it's easy to forget to do things I need to do. I can mark things on a calendar and forget to look at the calendar! Duh! I use the back of the front door for store errands and the steering wheel for gas refills and Post Office, etc. When I'm in the car I don't remember store errands until I open the fridge and "whoops". I would be lost without being able to write myself a note and stick it on the bathroom mirror, coffee pot, refrigerator, or steering wheel of the vehicle. I used to buy sticky notes but found that cutting up envelopes received in the mail also works well. The inside is plain and it's free. I just keep a roll of scotch tape handy to stick them where needed. It only takes a little piece of tape. You know all those business cards that you pick up and really never use? 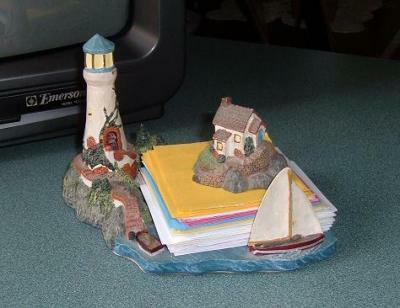 My mother keeps several of them in a visor CD holder along with some pens for writing. She has many of them labeled for errands she runs frequently such as gas, bank, post office, grocery store, and pharmacy. She keeps extras stashed away for jotting down occassional errands or notes on the go. Then she sticks them into the crack between the airbag mount and steering wheel where she can see them everytime she gets in her truck. It's such a great idea that I've started grabbing cards everywhere I go! I have joked and complained to my mother that I am getting as bad as she is with her memory and I need a dozen alarm clocks around the house to remind me of things I need to do or remember! I can't seem to remember to watch the time my kids are on the computer/video games/phone. I forget to check and see if they did their chores first, or my vow to turn the TV off after my favorite show instead of leaving it on all the time for background noise. I need help remembering to take my morning vitamins, or take my very important evening medication on time, or call for doctor or dentist appointments (haven't seen the dentist for nearly a year because I forget to call them until the office is closed!). I want a reminder to make the kids start picking their stuff up 30 minutes before bedtime, or follow through on my promise to the kids that they get to go to bed early the next night since they took so long getting ready tonight - get the picture? My kids sure do get the picture, they have at turns, become very frustrated at my poor memory when I forget to do something I promised, and also totally delighted when I forget they've only been playing that video game 3 hours! I've finally come up with a solution that works for me and my family. Lists don't work anymore, I forget to look at them. Alarm clocks and kitchen timers don't work, there aren't enough settings for what I need. I already use my cell phone alarms to remind me of medications and some appointments, but I have to change them frequently and forget to put the original setting back - thus forgetting my medication again! Then a recent cell phone carrier change left me with a nice, but useless cell phone - or maybe not so useless after all! Now I have FIVE alarms I can set to remind me. I have some that will stay fixed - such as when there is no TV, phone, games, etc. while homework and chores get done. And also to remind the kids to pick up before bed. And then I can also set some of the alarms to remind me of things I keep saying "I'll remember to do that tomorrow" like call the dentist, take the roast out to thaw in the morning, take a walk after dinner, and so on. Hey, if that isn't enough, I still have my husband's "useless" phone. Oh yeah, we just updated the kid's old trac phone recently,it has alarms too. The possibilities are endless, I can just see it, oops, hear it now. We have all left home without our purse, homework, cell, laptop, you name it we have left it. Sometimes, we leave the water running, or the stove on and those booboos can be disastrous. Each time I was putting my cell phone on "vibrate" to be considerate of others or in situations that require it, I was forgetting to turn the ringer back on. 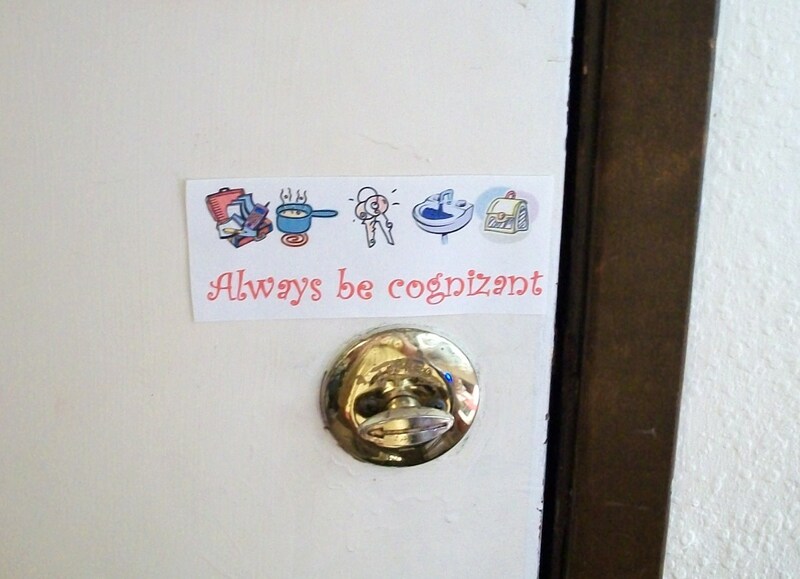 Whether it's an appointment, errand, or groceries, I have 2 simple ways to remember it. I have a small chalkboard in the kitchen where I write reminders and find myself glancing at it automatically several times a day. To remind myself for an upcoming event or task days, or even months in advance, I send myself a free greeting card from Yahoo. I schedule it to be sent the day before it happens, and forget about it. I always wear my jewelry (watch and bracelets) on my left arm. To help me remember something, I just remove all the jewelry and put it on my right arm. One glance is a constant reminder. There are a few smaller items I need to remember to bring each morning. To make things simple, I purchased a place mat from the dollar store. I traced the outline of each item onto the placemat. A great way to remind yourself of things like take the garbage out, return movies, an MD appointment, get gas, etc. is to place a note via a magnet with a clip on it for your note to be placed onto the metal door inside your garage on the door that goes into your home. 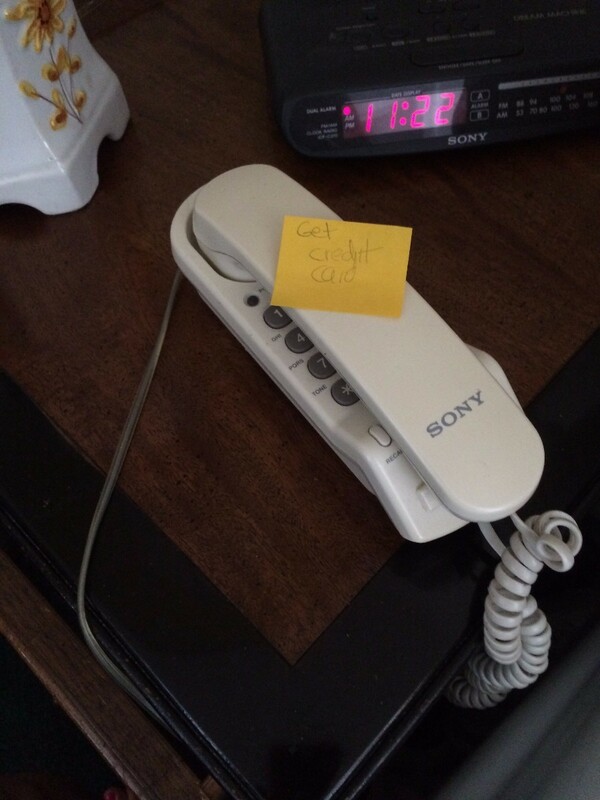 I put a Post-it on my phone by my bed to remind me to do/get something. The picture shows my reminder to get my credit card back after my husband took it to exchange a gift I bought for him with my credit card. If I had not reminded myself, I would have found myself stuck without my card the next time I needed it. My hubby keeps an empty soda bottle top in his truck. When I ask him to bring something home or he has an errand that day, he goes and sticks the cap up on the dash. Having trouble remember to make a phone call? I put the tiny sticky note "call son HB" or "Dr. Jones 10 AM" on my closet door the night before and on my kitchen cupboard where I keep my breakfast cereal. I was using Red Envelope for an event reminder, but they stopped sending notices. Does anyone have a system that works? One that reminds 2 weeks and 3 days before the event? If you use Yahoo! Calendar and have a cell phone, you can set your events on the calendar and then have it sent to your cell phone, or email. I started using it in September and it has been a life saver. I just input the event on my calendar, set the reminder for 15 minutes to two weeks before the event occurs and I don't forget. It's saved my bacon a few times. Plus, if the event changes, I can make the change and not worry about getting reminders for the wrong dates.